I can no longer remember how long ago it was that I met Maria Kritikos of Ladies Who Lunch (LWL). What was tremendously funny - and something we didn't figure out until later - was that we had a connection already. It was at Vancouver Fashion Week a few seasons ago that I looked across the runway to see Maria and her sister Joanna (Inspiration Mecca) sitting with someone I knew well - Anthe. Anthe works at the Fabricana in Richmond. During my five years designing and creating over 120 costumes a year, I bought endless meters of fabric from her and asked countless questions when I needed advice. It turns out Anthe is Anthe Kritikos - their mother! I only knew her by her first name, so had no idea. Life is funny like that. For the last year, I have been trying to attend one of the Ladies Who Lunch networking events. The universe just kept interfering. I would be out of town or have prior commitments every time. Then last Sunday, I was finally able to make it happen. The event was the LWL annual patio party being held at The Arbutus Club. Everyone was encouraged to wear hats or fascinators and we would enjoy networking, a lovely lunch and a fashion show. I was excited to finally get a chance to see what this group was about. sponsors Wanna Collection, Lumiere Skin Health & Wellness Centre, Abantu Hair, Wardrobe Apparel, Million Dollar Tan Vancouver, Cleopatra Brow Bar, Beauty Blvd, Essence Of L Medi Spa & Laser Clinic, Mischievous Socialite, and English Pronunciation For Success/English In Your Pocket. I made a beeline to put down my purse and jacket at my seat with Anthe and Irene Collingwood, then took a minute to wander the room. Our host was the lovely Natalie Langston who took to the podium with a big smile and dressed to the nines. After a short intro, Langston introduced founder Maria Kritikos who shared with us what the day was about, who some of the sponsors were and started the event off with a mixer game - network bingo. I think this was one of my favourites. We all put our business cards in a glass bowl and then were given an empty bingo card that you had to fill out with the names of other attendees. That meant we had to get up from our "safe" table and introduce ourselves to others. Names were then drawn from the bowl until someone reached BINGO. What a great icebreaker. Over the course of the event we were treated to several small talks from Kritikos encouraging us to speak our dreams out loud and choose who we spend our time with wisely. There was a lovely fashion show of stunning jewellery by Wanna Collection (also showing at VFW in September) and an amazing lunch where we could create our own beautiful salad from amongst a great array of ingredients. At the back of the room were several tables to peruse including a silent auction benefitting the Single Mothers' Alliance BC (founder Viveca Ellis took a few moments during the program to share with us about this great organization), a great new venture called Accept Me: Philanthropic Fashion and a beautiful display of jewellery by Wanna Collection. I have my eye on one of her jewellery cuffs. The day ended with Kritikos offering awards for the top three hats and then a group photo - not easy to orchestrate with such a large number of women in attendance. Want to know more about founder Maria Kritikos and all she is up to? Enjoy this great Q and A. And just in case you wondered - the two beautiful hats Maria wore this day were created by Always On Top Hat Designs - an LWL member! 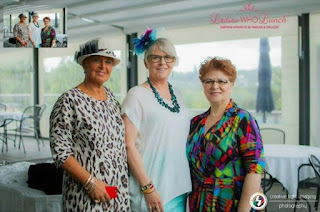 When did your launch the Ladies Who Lunch networking group? The group began with our 1st inaugural event on June 8, 2013! What is the concept/focus behind LWL? The idea was to bring together a global community of women in business, fashion & philanthropy living their dream and helping others do the same. I know you had a difficult moment in your life that changed your direction abruptly. Can you share a bit about that? At one point in my life I lost everything. Life as I comfortably knew it was no longer the same, & the rug was pulled out from under me leaving me in a less than desirable situation. But at the time, I didn't know that this traumatic experience would be my greatest gift ever. Like the expression goes, sometimes our greatest gifts are wrapped in thorns & sandpaper. The abrupt ending of my marriage was the catalyst for me to rise again and stand on my own two feet & show women that they too can create whatever life they dream possible, and that YES they do have the power to do it on their own. And this was one of my biggest realizations because once I was able to grasp this, I was unstoppable. Once women realize that they are the creators of their own life, destiny, financial freedom & happiness, they are truly free. It is only when you have lost everything that you are free to do anything. I know you also work as a real estate agent. How do you balance work, motherhood and the demands of running LWL and your other enterprises? We all have the same amount of time - the difference is how we use it. I prioritize and I don't have a TV anymore. I'm also up at 5am every morning and asleep by 8pm easily. At the last event you had someone speak their dreams saying how important it is? Can you share what you meant? When we declare our goals & intentions to the universe a magical thing happens. The universe responds yes, and moves people, places & things to make your dream a reality. Also accountability is huge! You've now just told a room full of women who are going to hold your feet to the fire to do what you said you were going to do! You don't want to let them down do you? What do you feel is the biggest benefit of being a part of this organization for women who are interested? I always tell women, "You will meet someone in this network who will change your life." It's all about being open to the limitless possibilities that come from networking with a group of like minded, influential, supportive & powerful women. Let me know where I can send your invite! Visit www.InviteFromMaria.com You can attend ONE event as a guest, but then membership is required to continue attending. We have 3 levels to choose from. Can you share a bit about upcoming LWL event that are in the works? We always have our Signature Event that happens every year with our big fancy hats but we also have other gatherings such as mixers for the members to get to know each other better. We are hosting an event in September with JAC. We also have recently partnered with Holt Renfrew where we held our www.Shop4Hope.ca event in May of 2015. We have another Shop4Hope planned for November again with Holts. -Monday morning with Maria is a motivational podcast for our members only. I share business tips & strategies & what I love most inspirational & motivational messages. -I'm also the creator of the course Idea To Reality which helps women get into the right mindset for success - more info here: www.IdeaToRealityCourse.com. -I'm launching www.ShesInBiz.com an online academy to help move your business forward for female entrepreneurs in business under 2 years. - Finally. because I'm a teacher, I LOVE facilitating my www.MasterMindWithMaria.com both LIVE & virtual!